The Forex Smart Tools Calculator and Trade Log are created to help you become intelligent Money Managers and gain you entry into the elite group that actually makes money trading Forex. It's precise Money Management that is the secret that all Professional Traders know. It takes more than just great strategies, robots or signal services to be consistently profitable. Know the exact position size you should use to keep your maximum loss to a constant, regardless of how big your stop loss is or which currency pair you are trading. This is computed for each trade, based on your risk profile settings, the pip value of the currency pair you are trading, and the stop you have set. Knowing this in advance allows you to maximize your position size, without taking on more risk than you intend. It also allows you to accurately reduce your position size when a stop is larger than you ordinarily trade, and still be able to take the trade with safety. The ForexSmartTools Calculator is designed to display your assets in your own currency in however many digits your broker uses. It quickly figures in Bid and Ask for you and has the ability to calculate in standard lots, minis, micros, macros or units. Quick and easy calculations show you where your Stop Loss and Profit Targets are and what they will look like on your chart. The Calculator shows you the percent gain you stand to make, as well as the percent loss you will incur if the trade doesn't work. In this way, you will always know exactly how much you are willing to risk for each trade. Extra options are built in for those who use Stop and Recovery strategies, or those who want to find their Break Even quickly when in a multi leg trade. The ForexSmartTools Trade Log is a state of the art customizable Log that is designed just for your style of trading. It keeps an accurate log of all the trades you take, by day, week, month and year. Make your tax reporting easy. Compare your different strategies, trading times of the day, patterns and see what is working best for you. Become your own Accountability Coach. Use the Trade Log Projected Annual Returns page to let you look to the future and set realistic trading goals. One clean page handles all your currency pairs and multiple trades simultaneously. As you change from one currency to another, all your previously entered data is saved, and reloaded when you come back to that currency. Clear All button wipes the slate clean for that one currency pair only. Let The Calculator remember which side of bid and ask you need to be on, depending on your trade direction – just enter the stop you actually see (such as a swing high or low, a moving average, previous support or resistance, etc.) and The Calculator will compute the value you should actually set for your stop. It will even tell you what that stop is going to look like, since half the time you may be exiting on the ask, which is not directly displayed on most charts, and is hard to remember on any chart. Dial in your take profit goal with a handy drop down menu and see what that level will visually look like on the chart (it remembers bid and ask for you, and which side of the trade you are on). 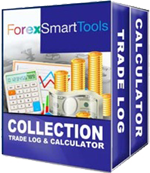 Both the ForexSmartTools Calculator and Trade Log are free-standing PC applications. Your data is stored on your own computer, so it is secure and available to you each time you open the program, without using up a lot of ram. Each purchase includes 2 licenses, one for your lap top and one for your business computer. Works with live currencies so prices are up to the minute accurate. Keep an accurate log of all the trades you take, by day, week, month and year. Compare your results with your broker and make sure their reports are correct. Make tax time easy. If you have multiple brokers summarizing your trading can become a nightmare. The Log will let you print standardized reports for each broker. With equal ease, you can see how successful your trades are based on entry times, session or day, currency pair - whatever values may be appropriate to your own style of trading. Spot patterns that you might not otherwise see, allowing you to detect problems with your trading system that result in lost profits. What if you had a few different trading strategies or entry triggers you used... In your mind, you might think they were all equally effective, but you might be surprised to learn that one of them was consistently less profitable for you than the others. This is hard if not impossible to spot without being able to look across all your trades and do analysis. With The Trade Log, you'll be able to spot those patterns quickly and easily.